Currently, veterinarians diagnose lameness by watching the animal walk and by feeling its bones, joints and limbs. The vet typically observes the animal walking on a flat surface, such as in a hallway, watching for a limp or stagger. In equine medicine, veterinarians will run horses at different speeds and in circles. Also, equine veterinarians commonly use other tools and techniques to help identify lameness including stressing the joint and nerve blocks. In addition, incline and decline walking changes how weight is distributed among the limbs. If we were to extrapolate current knowledge about lameness and injuries, if an animal is lame on one limb, it will put less weight or force on that sore limb because it is painful. 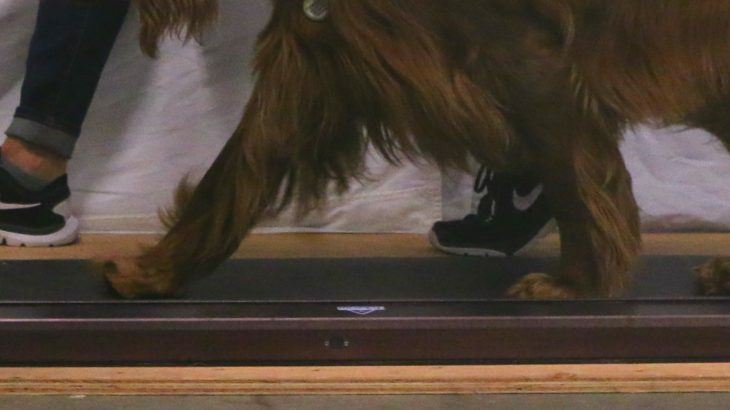 Walking on a ramp shifts the weight of the animal, which challenges the dog’s ability to reduce the stance time and force exerted by the sore limb. This change in weight distribution might exaggerate the lameness and make it more easily noticed and diagnosed. 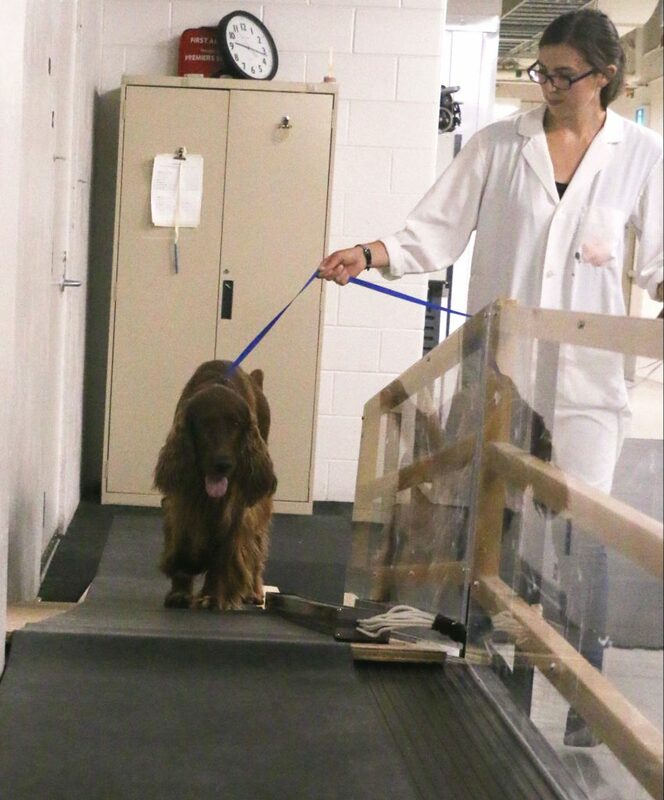 To gather the necessary data to identify and describe these gait changes in both healthy and lame dogs on flat, inclined, and declined surfaces, Dr. Pinto’s team at WCVM is using a pressure-sensitive walkway. The walkway is a mat with embedded sensors that detect and measure subtle differences in kinetics as an animal walks on it. 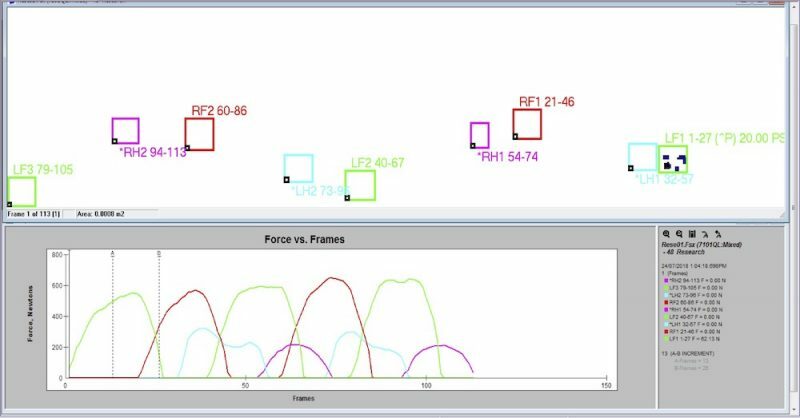 Capturing the kinetic data of the dog’s walk allows the researchers to analyse the stance-time, stride-length, and pressure changes that occur. 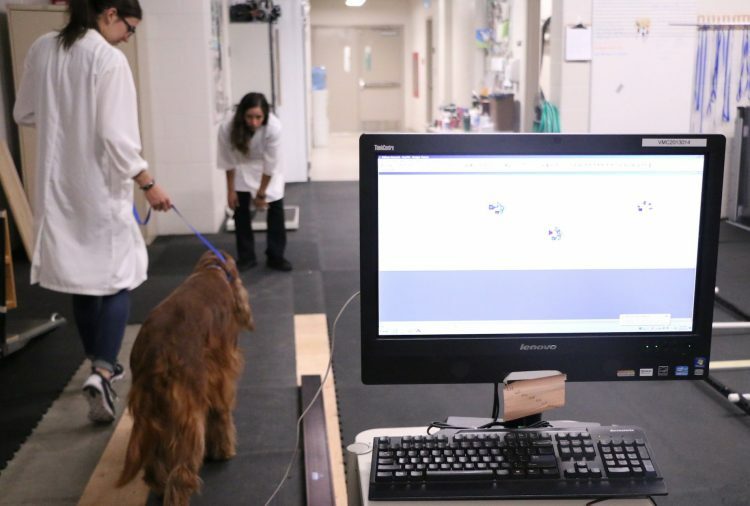 Some clinics use the walkway on the flat surface to diagnose lameness by comparing the forces exerted and timing changes by each paw as the animal walks across the mat. The study currently underway at WCVM is the first to use the walkway to measure and describe how animals — in this case, healthy dogs and dogs with hindlimb lameness — move on inclines and declines. The research to date has determined that when walking uphill, dogs shift their weight to their hindlimbs, with their hindlimbs spending more time on the ground during each stride than on flat surface. The opposite happens when a dog walks downhill: the weight shifts to the dog’s forelimbs and its limbs — the hindlimbs, in particular — spend less time on the ground during each stride. The study has found that lame dogs distribute their weight in similar patterns — shifting weight to their hindlimbs on incline and to their forelimbs on decline, but reduce the force of the injured hindlimb and its time spent on the ground. The researchers hypothesize that, when an injured dog walks on a decline, the dog’s ability to compensate for the injured limb causes specific gait changes that accentuate the lameness. Dr. Pinto and Dr. Muir hope the research leads to a better understanding of the diagnostic tools and techniques that veterinarians use to more easily diagnose lameness, as well as advance rehabilitation in injured dogs. Emma Thomson is a student at the University of Saskatchewan’s Western College of Veterinary Medicine. She wrote this post as part of Science Borealis’s Summer 2018 Pitch & Polish, a mentorship program that pairs students with one of our experienced editors to produce a polished piece of science writing. Guest Authors, Health, Medicine, and Veterinary Science, New Science Communicators, Technology & Engineering diagnostics, Emma Thomson, lameness, new science communicators, Pitch and Polish, rehabilitation, University of Saskatchewan, Western College of Veterinary Medicine. permalink.